When Did I Become a Caregiver? 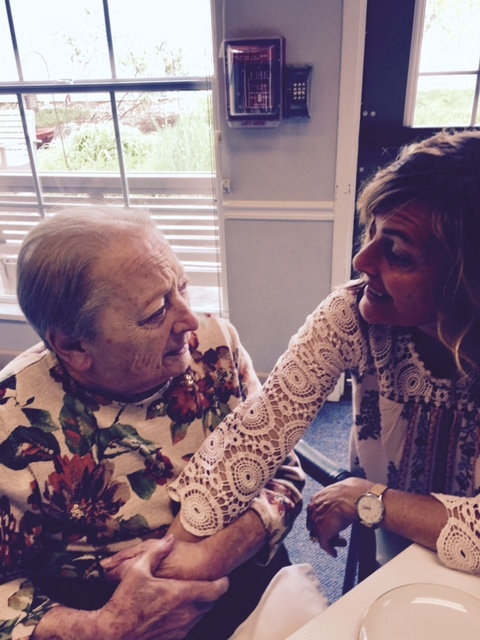 – Find You in the Sun – A daughter's slow waltz with her mother's dementia. Mom often reaches for my hands and arms, when she is cold, when she needs warmth. That day, like many others, I was entangled in her embrace. A question someone posed earlier floated still in my head, during the noisy, silent time of Mother’s Day tea. When did you know you were a caregiver? After five years with Mom, I should know the answer to that question. But does the origin go back even further? For me, it did because of my first husband. But had that just been who I always was, a part of who I am, or was it a part of who I was becoming? Mom only released my arms and hands when an older woman came around and waved a plate of brownies beneath Mom’s nose. “No, thank you. We don’t need the peanuts,” I spoke up for two, shaking some blood back into my upper extremities after Mom’s grasp. The woman, a member of the Delta Psi sorority that arrived every year to freshen the tables with linens and teapots, pleaded with her eyes for me to take one, at least one. “OK, I’ll take a piece and just lop off the peanuts before giving it to Mom. She has swallowing issues,” I said, to sum it up nicely and not go into any lengthy discussions on digestion. We, er, Mom, was on the fifth course of dessert, after four courses of finger sandwiches made from ham and cheese, cream cheese and zucchini bread, pimento cheese, and egg salad. We had eaten Madelines, strawberry cakes, butter cream cupcakes, and wafer that was basically carmelized brown sugar over graham crackers, something someone might bring to a campfire, and tasted equally as devilish. I hated being the gatekeeper to Mom’s stomach, but her caregivers, the REAL ones, would have to deal with the consequences later, and since I would be out of town for a week, I’d rather not have them dissing me under their breath while I was away. But those caregivers? They were the real partners in the scheme of caregiving, so why even ask myself the question, When did I become a caregiver? Mom was in their company twenty-two-and-a-half hours of the day, and me, all of ninety minutes. In an earlier post, I noted my parents had named me Health Care POA. To be honest, the designation was by default as much as anything else. I was not privy to the conversations my parents might have had, or knowing them, not had, because what Italian didn’t just sweep everything under the rug or bury it beneath the tomato vines? What then, in my makeup, brought me to the edge of this vocation time and time again? Was it the flexibility I had in my work? Was it the fact that I must have done such a stellar job with Devin, read irony, that I became the obvious choice? When did I even know or think of myself as caregiver for Devin? During Devin’s bone marrow transplant in Seattle, as part of his admission, one person was to be the designated caregiver, like the designated hitter, schedule to come in off the bench, anytime, when bats were hot or cold, to pinch hit or to make a difference in the game, when the team needed a bunt or a homerun. That was me. But before that, most people who knew me wouldn’t say I was the warmest and fuzziest person to be around. I could be rather direct, I didn’t make chocolate chip cookies for every new neighbor, only pizzelles for my favorite ones, and considering myself twenty years ago, I didn’t know how to ask for what I wanted. And that was my first lesson in caregiving. My first lesson in what was required to be a caregiver was to become a demanding, bitchy woman who accompanied Devin to all his treatments, and went in search of a nurse the second the IV pump began beeping, or that he needed water. The list was as endless as the beeping. But the truth is, anyone of us at anytime could be called to be a caregiver. Look at me. You don’t have to do it well. Or with a lot of enthusiasm on the days when you can’t muster happy, happy, because of menopause, or your mother twists your arms so much you think she might break it. But you would do it. You would show up, because you can’t imagine not showing up. Because your mom took care of your kid when you took care of your husband, and isn’t that the least, maybe the very best, you can do? He might even be a better kid because he was raised by grandparents for a while, with a little more soda and chocolate than you might have liked, but hey, he was your first, you would have caught on. So, when did I know I was a caregiver? It wasn’t because my father put my name on a few documents. He could have done that with any of my siblings. I doubt it was because I had always told Dad I would take care of Mom. I doubt it was because of my time with Devin, because by most outer appearances my actions might have appeared heroic, but those instances were difficult, and there were days when I had to admit to the harsh reality of letting go of someone I loved. Maybe it was because of my time with Devin. Perhaps that’s what defines a caregiver. That I will say, “no,” to endless rounds of testing, or raising Mom in and out of gurneys on ER runs, or playing keep away from countless needle pricks in her arm. That I will know how to let go. The ultimate requirement of being a caregiver is knowing when your charge no longer needs your care. That’s when you become a caregiver. I whispered in Mom’s ear. “I’ve got to go, Mom,” I had an Engagement/Derby party to attend and was already late. “You have to go?” Mom repeated after me, like a little pappagallo. She was still mesmerized by the music and what might be crumbs left on her plate from the brownies, wondering if she ate them all, or if there were more treats, or what exactly she was doing there in that room with ladies wearing wide-brimmed hats, and who was the person who had just called her Mom. “A pui tarde,” we exchanged in Italian, back and forth several times. “Love you, Mom.” I held my arms around her shoulders for a long while. And then I slipped away.